A new video is on-line today, covering the transition from Rel-14 completion to the task of meeting two major milestones for Rel-15, within the next twelve months. 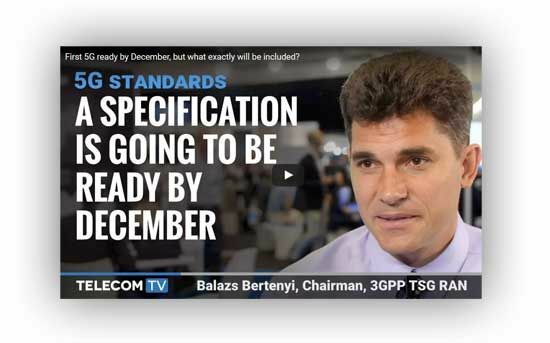 The video has news on the early drop of 5G NR specifications for December 2017 and some words on the full set of Rel-15 features - due by June 2018. Balazs Bertenyi considers some of the potential challenges ahead, observing that “…If you look back how long it took to develop the first LTE Release in 2008/2009, this [5G] looks like a very aggressive time schedule, but the commitment level across the industry is very high.” He said that although some Rel-15 content could potentially get ‘down scoped’ to meet the first drop in December, he remains confident that 3GPP will have the functionality for the non-standalone system fully specified by that time. Guy Daniels, of telecom TV, asked whether the pre-5G trials and tests could have an impact on the standards process. Balazs Bertenyi predicted that the commitment to migrate back towards the global standards track is there. He believes that the pre-standards solutions will drive forward hardware development towards commercial launches, but not have a negative impact on the standards process. For Rel-16, study work will now start after September 2017 – to allow Rel-15 to be completed. However, when we get started on the next release it will deliver full 5G with, what Balazs Bertenyi called; ‘more revolutionary’ functionality.